November in Bedfordshire is a month of continuing arrival and settling in of our winter visitors. Increasing numbers of the more familiar visitors become noticeable in woods, fields and on our water-bodies. More unusual visitors can be found though inclement weather is often required to provide the highest probability of a county rarity. Early in the month, migration of finches, thrushes, Starlings and Wood Pigeons continues with early morning visible migration counts recognising many thousands of birds an hour in favourable conditions. Most birds are moving westerly into wintering areas in Britain and Ireland, but Wood Pigeons in particular will be moving south in large numbers between northern breeding grounds and the warmer climates of southern France and Spain. Feeding and roosting flocks of these species are well distributed in hedgerows and fields while other species such as Golden Plover tend to be found in traditional areas. 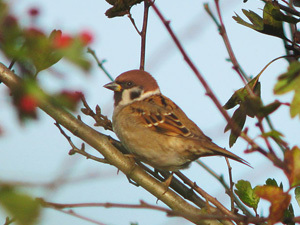 Tree Sparrow flocks have also been found at some regular farmland sites in recent winters, and there are surely more to be found. Searches of hedgerows neighbouring game strips are most likely to reveal the species along with good numbers of finches and buntings. One winter visitor that creeps in almost unnoticed is the Blackcap. They are most frequently found in gardens and are attracted to softer food items such as fallen fruit or fat balls. The significant increase in recent years of this visitor from central Europe has now been accepted as an indication of a new and successful migration strategy developed in response to man-made factors including the provision of garden feeding. Numbers of duck, both dabbling and diving species build up on all suitable waters. 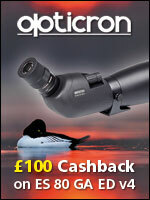 Attractive species such as Goldeneye and Goosander become visible in the county after a six month absence. The large expanse of water at Stewartby or the large rafts of diving duck at Brogborough are most likely to attract scarcer visitors such as Scaup, Common Scoter, Red-necked or Slavonian Grebe, Red-breasted Merganser or more unusually Long-tailed Duck, all of which show peaks of occurrence in late autumn. One bird that has eluded observers in the county so far is Lesser Scaup and it is only a matter of time before one lucky, and diligent observer, finds one hidden in a group of Tufted Duck or Pochard. Unfortunately, hybrid ducks are often present to add to the confusion of identification. Bewicks and Whooper Swans, Brent or grey geese can be found during the month when small parties may be misplaced from their normal migration routes in poor weather, fog or rain. These conditions also make the appearance of a diver or a Shag more likely. A large storm system also has potential for moving seabirds or coastal species into the county though with the peak of migration now past this is not the best month for a real rarity. Top class county rarities in the month are fewer than October but include Velvet Scoter (1983, 1988, 1991 and 2016), Rough-legged Buzzard (2005), American Golden Plover (1991), Pomarine Skua (1985, 1988 and 1999), Little Auk (1995) and Shore Lark (2004 and 2012).